View and edit your schedule from your phone or tablet. 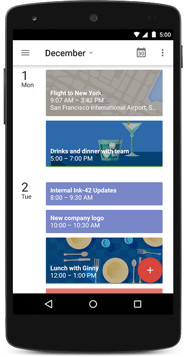 Use Google’s optimized mobile apps or sync with your phone’s built-in calendar. Share special events with customers or let people know when you’re available with easy calendar publishing. Calendars can also be integrated directly into our Platform. Browse and reserve conference rooms, projectors or foosball tables from your calendar. It’s easy to set up shared rooms or resources and add them to Calendar events. Yes. You can create a calendar that’s accessible to everyone in your organization (or a subset of users). For example, you might want a group calendar for events like team holidays and regular meetings. Yes. By default, Google Calendar displays a pop-up reminder 10 minutes before an event. You can change reminder times within Calendar’s settings.